See the Vatican as you’ve never seen it before and enjoy a visit to the world famous Vatican Museums with your own private English speaking guide. Thorough your special entrance arrangements made by Italy’s Best, you will discover some of the museum’s most intriguing areas. In addition to the standard Museum masterpieces, the itinerary includes exclusive access to sections normally closed to the public, such as the private chapels of the Pope, inestimable treasures and a breathtaking terrace with incredible panoramic vistas of the Eternal City. As you walk through the papal palaces, the artwork presents an authentic sense of the museum’s extraordinary history. 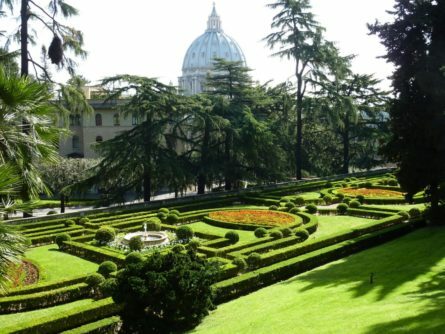 The tour begins in the Vatican Gardens where your expert, English-speaking guide will lead you through the stunning French, English and Italian landscaping filled with beautiful sculptures, fountains and grottos. Every pope has spent time amongst this serene greenery meditating and praying. Follow in their footsteps and see the botany representation from every continent. Here, you’ll also be made privy to what is considered one of the best views of St. Peter’s Basilica. With your special entrance arrangements, you will also be given access to the Vatican Train Station, the Gas Station and the office buildings. Next, head inside for exclusive access to restricted sites such as the Cappella Niccolina and Bramante’s Staircase, as well as the Vatican highlights that include the Sistine Chapel and the Museo di Pio Clementino. Enter the enchanting Sistine Chapel, where the cardinals hold the papal conclave, and contemplate Michelangelo’s vibrant frescoes, one of the most renowned artworks from the High Renaissance. Let the vivid colours and bold figures of the ceiling images and Last Judgement mesmerize you. Cross the threshold into St.Peter’s Basilica directly to see Michelangelo’s Pieta and the Michelangelo’s impressive dome. As the burial place of St. Peter, Rome has always been considered a holy city a second Jerusalem. St. Peter’s Basilica, the greatest landmark of sacred architecture ever built, is stunning in size and magnitude. Having taken more than a century to complete (1506 to 1616) under the tutelage of eighteen popes, the fascinating history of this vast project can be found within the interior’s rich gilding, magnificent statuary and solemn papal monuments. Please note that throughout the tour clients will be accompanied by a Vatican officer to secure opening of closed sections. The open areas are subject to change at any time.